Affordable versatile performer. 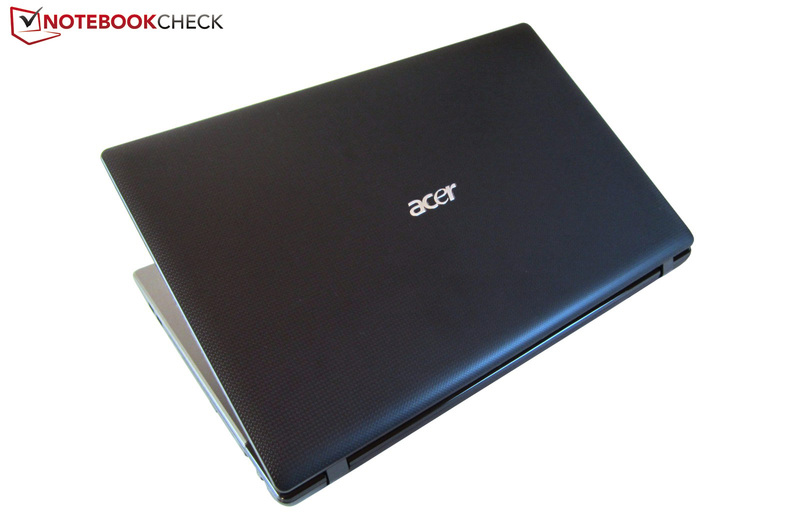 Acer uses mainly on components from AMD in the Aspire 7560G. A quad core Fusion processor and two graphics chips in CrossFire mode are available in only few devices. And best of all: The interesting hardware combination only costs €600. Is it an alternative to the established Intel/Nvidia notebooks? Besides an attractive price (~ €600), the Aspire 7560G scores with an unusual component arrangement. 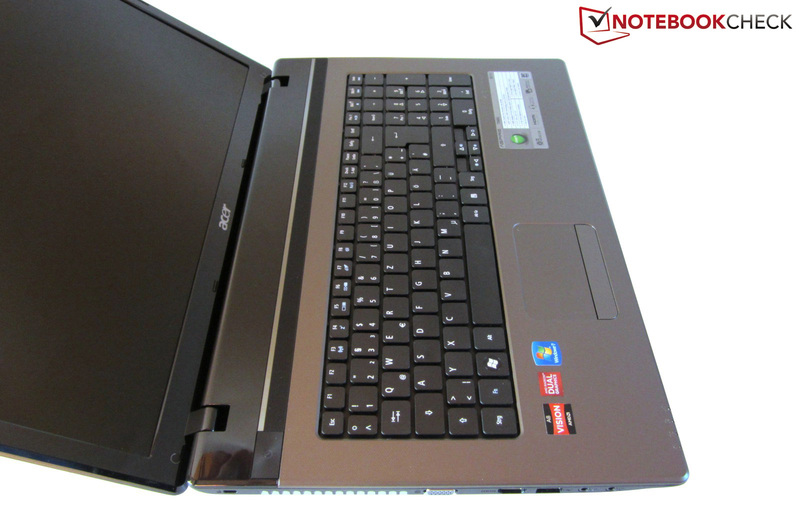 While most multimedia notebooks have a Sandy Bridge processor from Intel (Core i3/i5/i7) and a midrange graphics card from Nvidia (e. g. the popular GeForce GT 540M), the Aspire 7560G is mainly powered by AMD hardware. Our (currently not available) test device, named 7560G-83524G50Mnkk, is so to say the top model. The installed quad core CPU, A8-3520M, has an integrated graphics chip called Radeon HD 6620G and belongs to the currently fastest mobile processors in AMD's range. The Radeon HD 6650M, a dedicated graphics card from the (lower) midrange, is also installed. A highlight: Both graphics cards run simultaneously in a performance boosting CrossFire mode, which is otherwise primarily seen in high-end devices. In optimal conditions, the system calculates significantly faster than with a single graphics card. AMD calls this dual GPU array Radeon HD 6740G2. The other equipment is rather unremarkable. 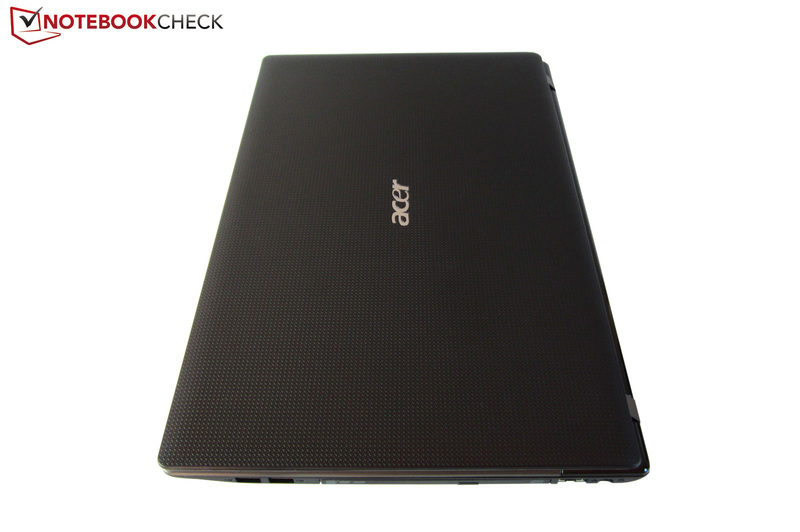 Acer has opted for a 500 GB HDD, a conventional DVD burner and four GB of working memory (2x 2048 MB DDR3 RAM). The 17 inch glare screen has a resolution of 1600x900 pixels; Windows 7 Home Premium 64 bit serves as the operating system. 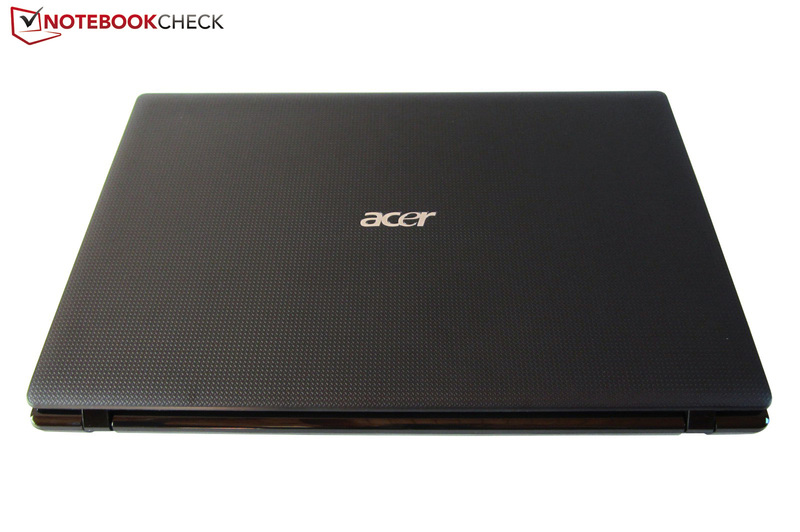 Apart from the processor, the device equals the Aspire 7560G-8354G50Mnkk listed by several dealers (A8-3500M rather than A8-3500M). The Aspire 7560G looks fairly plain in a closed state. Despite its textured surface, the black lid is fairly ordinary. As soon as the lid is opened, the user is confronted with a gray (and nicely patterned) keyboard bezel that successfully creates a contrast to the other surfaces. The manufacturer doesn't make any experiments in design. The multimedia machine is to appeal to as wide a customer base as possible. Great: The case doesn't grime too much due to the mostly matt finish. Exclusively plastic is used as material for the notebook and that is also noticed clearly. Quality impression and workmanship are solid. Merely the transition between lid and display bezel wasn't processed quite cleanly. A high stability shouldn't be expected from the Aspire 7560G. Typical for a notebook, the lid can be warped significantly. At least the base unit's bottom proves to be quite stable. In return, the top can be dented noticeably in the drive and battery area. Both hinges have to accept criticism, too. Vibrating surfaces can cause the screen to wobble. 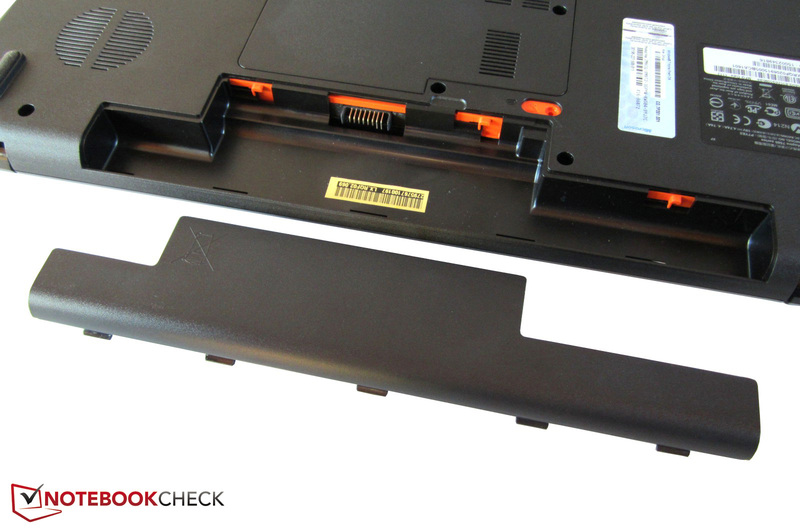 Moreover, the base unit lifts considerably when the laptop is opened. 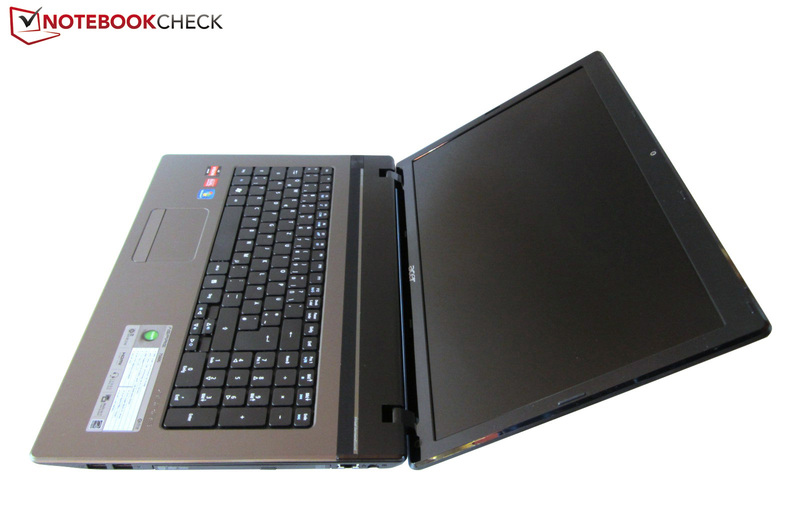 Although the multimedia notebook stays under a height of four centimeters and a weight of three kilograms, the 17 inch device is only suitable for frequent carrying around to an extent. All in all, the case quality moves in the midfield. 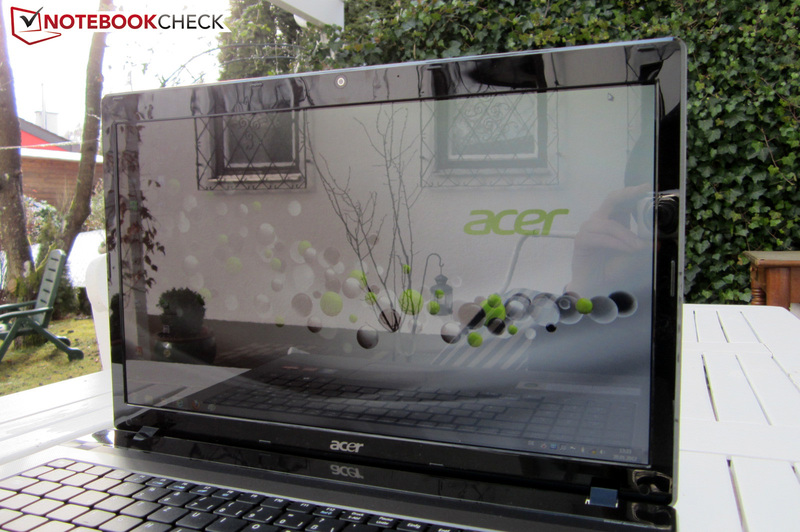 Acer has done a good job on it. The multimedia notebook can't boast with a generous connectivity. The manufacturer completely cuts FireWire, eSATA and ExpressCard. A USB 3.0 port can't be found anywhere either. The existing ports are on the left for the most part. In addition to the vent, there is a Kensington lock, a VGA and HDMI port, two audio jacks (headphone + microphone) and a USB 2.0 port. The right sports a RJ45 Gigabit LAN port, power socket and two more USB 2.0 ports. Acer also integrates a 5in1 card reader on the front (SD, MS, MS Pro, MMC & xD). We don't like the interface arrangement quite as much. Since most ports are placed very far to the front, a lot of elbowroom is lost when many cables are connected - keyword: mouse. 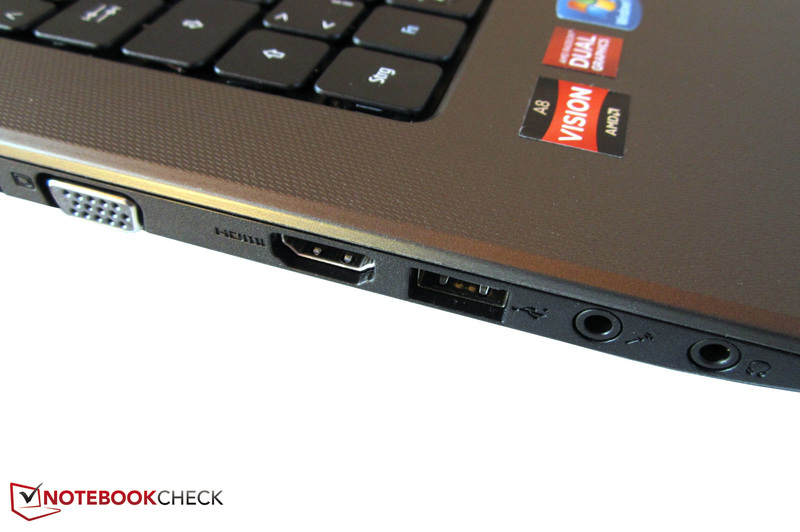 The Aspire 7560G naturally also has a module for wireless communication. The Broadcom model supports WLAN but not Bluetooth. It's annoying that Acer installs an exaggerated amount of software. We count about 50 programs and drivers. Many components are more than just unnecessary and only slow down the Windows routine (boot time, reaction speed, etc.). 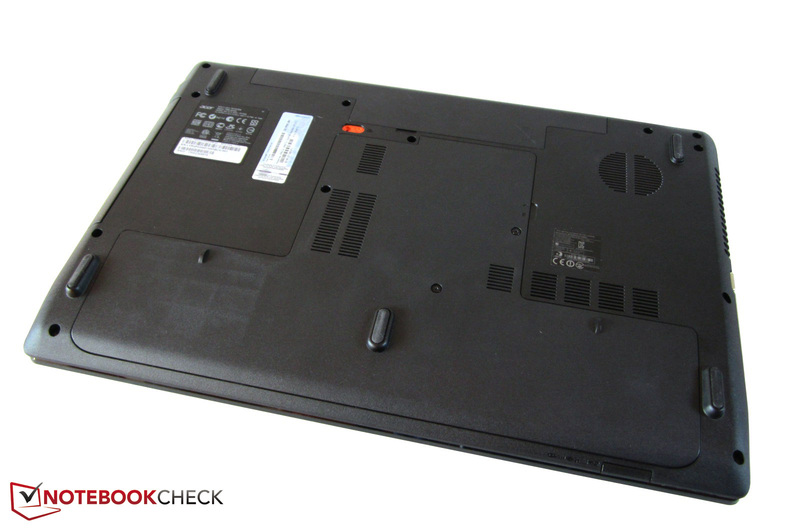 However, the 17 inch laptop didn't really get into gear even after a thorough delete action. That is primarily due to the slow HDD. The adjective "slim" can be used for the scope of delivery. In addition to a fairly compact 90 watt power adapter and a long 6 cell battery, only a quick start guide and a warranty card are found in the box. 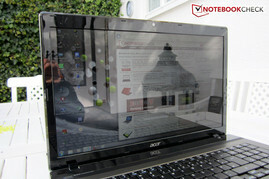 As to the warranty, Acer takes care of possible damages for two years after purchase. The warranty is even valid for 12 months internationally. The keyboard's typing feel is definitely a matter of taste. The author of this review found the 16x16 millimeter keys pretty wobbly. In contrast to other multimedia devices, such as the Schenker XMG A501, the trigger response makes a rather unclear impression. We also have to complain about the small arrow keys and the not exactly quiet typing noise. The dedicated number pad, the well-designed layout and the cleverly arranged FN function keys save the keyboard from an even worse rating. 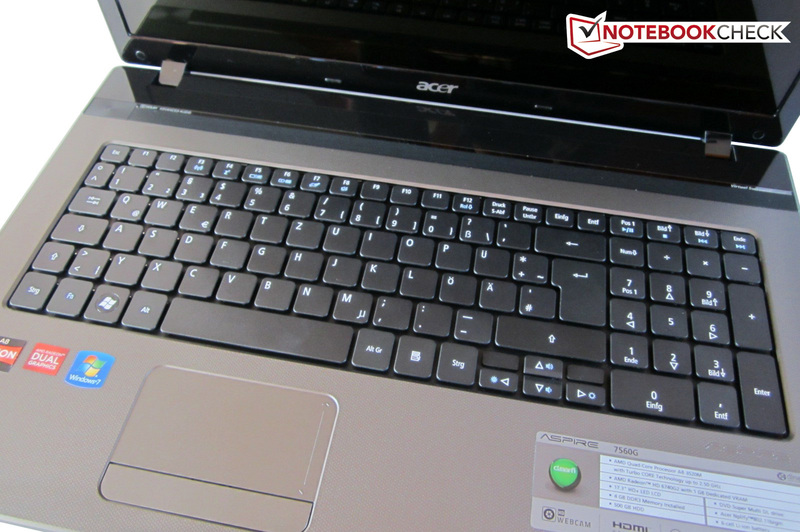 Acer should have used its newer keyboard model that is found in the Aspire 5755G. 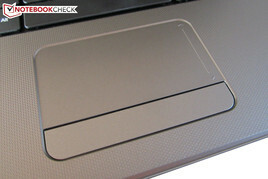 The lowered touchpad in a good size of 86x45 millimeters doesn't provide quite as much reason for complaint. Among other things, we have multi-touch support on the pro side. It enables two finger gestures, such as zooming, rotating or scrolling. 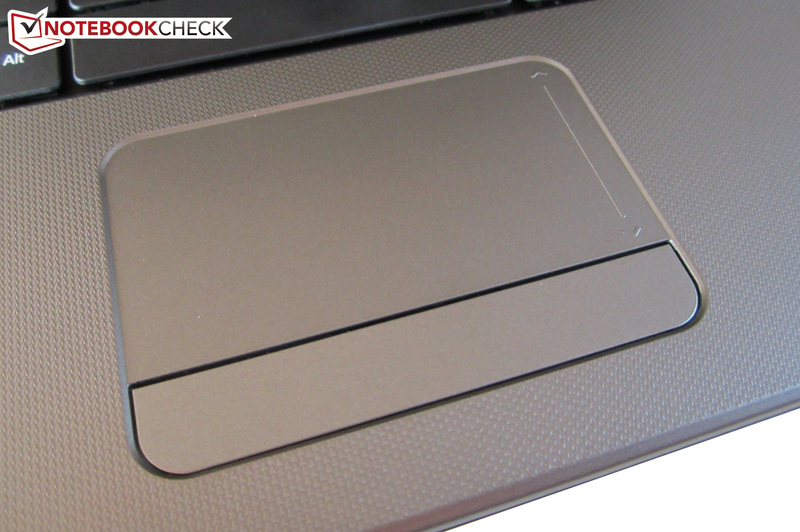 It's possible to glide over the touchpad easily due to the fairly smooth surface. 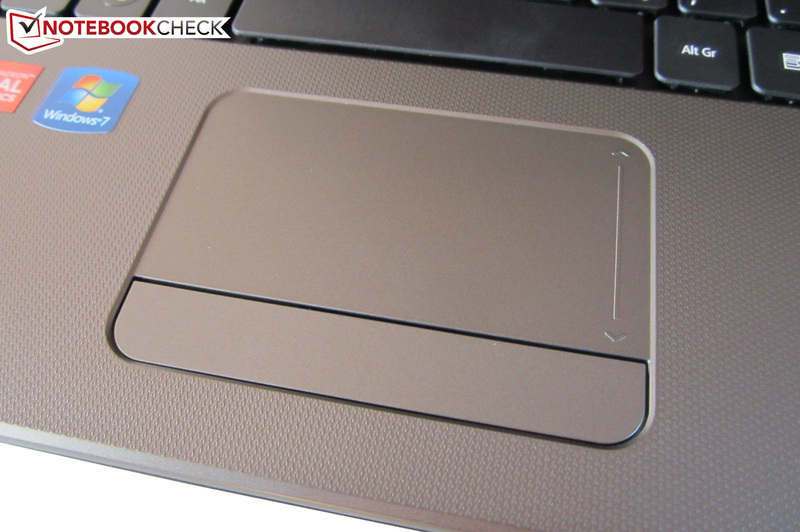 The touchpad worked accurately for the most part in the test. Gestures were also almost always identified correctly. 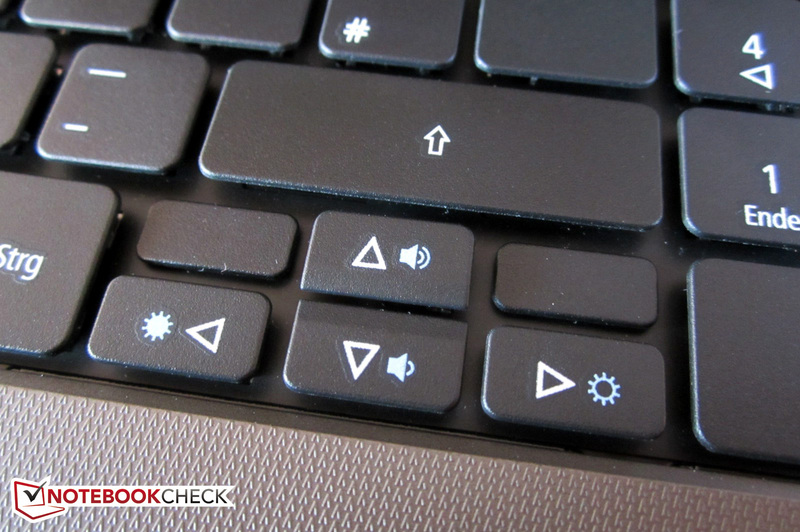 The marked scroll bar on the right touchpad edge also has to be praised. Merely the mouse keys make a cheap impression and are worthy of improvement in our opinion. Acer made a good choice in using a screen resolution of 1600x900. 1920x1080 pixels would have been better for a 17 inch size because it supplies a bigger desktop. But the Radeon HD 6740G2 would have had a very hard time with modern games. 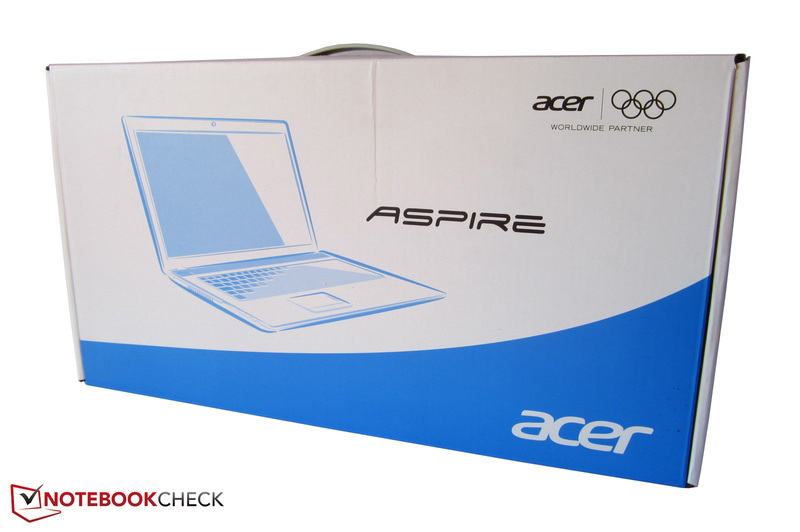 As almost all modern devices, the Aspire 7560G comes with an LED backlight and an aspect ratio of 16:9. As expected, the manufacturer uses a low-end, run of the mill screen (LG LP173WD1-TLA4). It starts with the brightness, which is a bit below notebook average with 185cd/m2. At least all media comes into their own fairly well indoors. The contrast of just under 200:1 also falls short of the possible. Good screens manage three to five times as much (for example, g. the Asus N75SF-V2G-TZ117V). Dark game and video sequences are displayed rather grayish due to the high black value (~1.0 cd/m2). The colors don't add to the score either. It's not even enough for the sRGB color spectrum. The glossy surface can at least hide the listed shortcomings to an extent. However, we have to note that most contenders don't do a much better job with the display rates. The moderate brightness takes revenge in outdoor use at the latest. 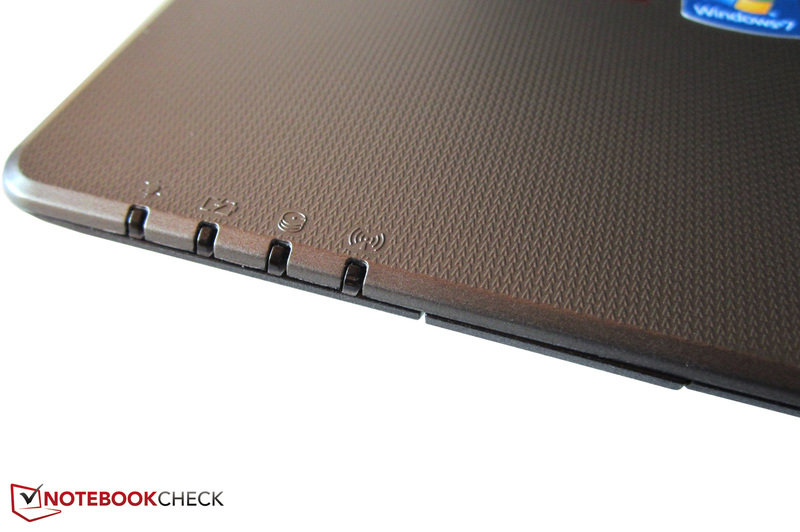 Using the notebook isn't fun in combination with the glossy surface. 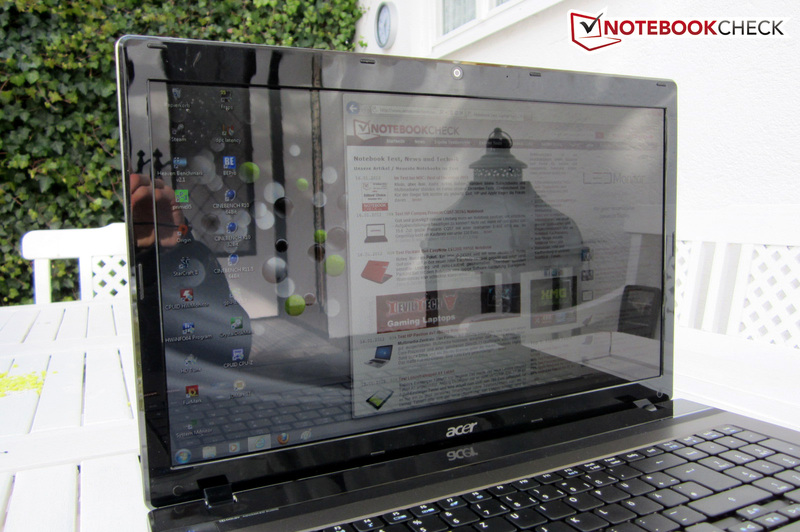 As can be seen on the pictures below, annoying reflections are created in the daytime and make eye-friendly use impossible. The displayed content can hardly be recognized in the worst case. If a frequent outdoor use is intended, a device with a matt screen should be used. The viewing angles aren't bound to break any records either. The brightness already changes with the slightest deviations vertically and make it necessary to adjust the screen frequently. It's hard to ensure an acceptable picture for several viewers due to the weak horizontal viewing angles. 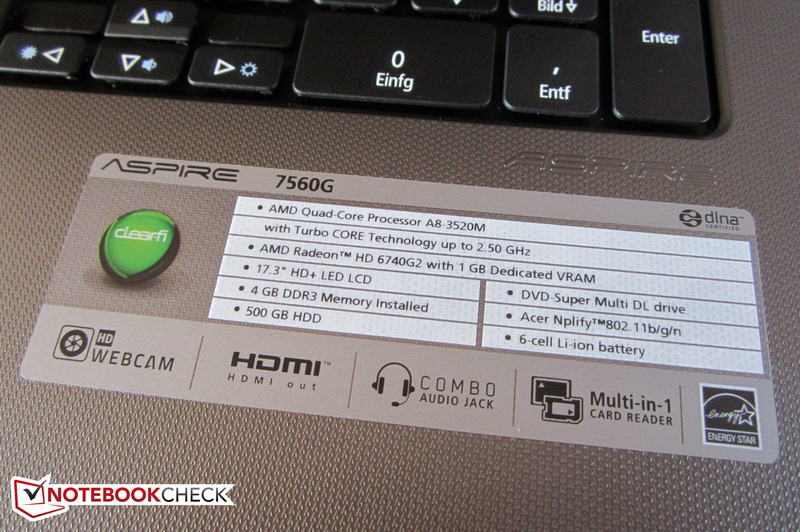 Unlike most multimedia devices, the Aspire 7560G isn't equipped with an Intel CPU, but with a processor from AMD. The A8-3520M (codename: Llano, socket F1) is a scion of the Fusion family, which unites several processor cores, a graphics core and other hardware accelerators on one die. This concept turns the CPU (aka APU) into a multi-purpose weapon that is to equip the user for every task. The A8-3520M's four cores usually run with 1.6 GHz, but can be overclocked up to 2.5 GHz via the Turbo Core technology (greetings from Intel's Turbo Boost). On the other hand, the Fusion family lacks a counterpart for Intel's Hyper Threading technology (simulates virtual cores). Thus, more than four parallel threads aren't possible. The thermal design power of 35 watts equals Intel's Core i3, respectively Core i5 models (also 32 nm structure width). The latest Fusion generation can't serve with an L3 cache. But at least the A8-3520M's L2 cache has a capacity of four MB. The Turbo Core technology completely disappointed us in practical use. The processor only clocked with 1.6 GHz regardless of whether only one core or all cores were loaded. The maximum 2.5 GHz were only reached for a short time. 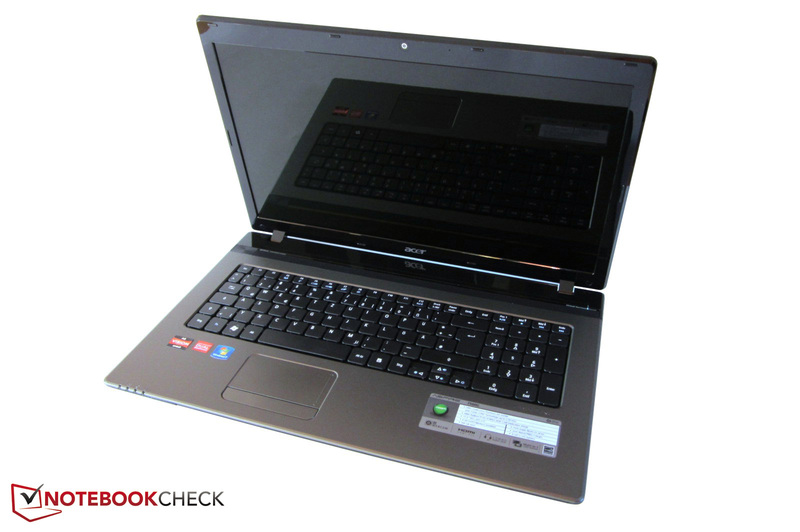 It's no comparison to a typical Intel notebook that usually gains several 100 MHz during load. 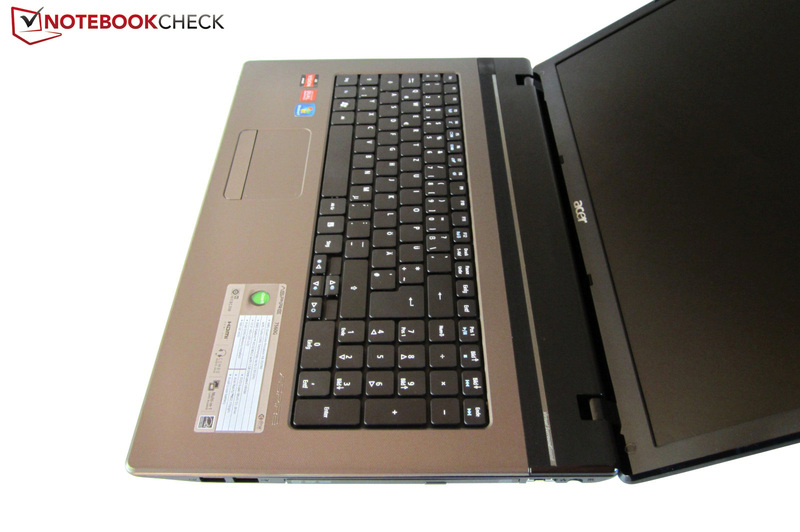 Although the A8-3520M has four cores, the user has to be content with a below average performance. The processor doesn't stand a chance against Intel's dual Core i3-2310M, which for example is installed in the equally expensive Sony Vaio VPC-EH1M1E/W.G4, in Cinebench R10 single core rendering. The Core i3-2310M takes a lead by over 50% not least because of the higher clock rate (3452 vs. 2284 points). The Fusion APU copes much better with multi core rendering: With 7454 points, the A8-3520M calculates about as fast as the immediate Intel contender (7573 points). Overall, the performance is only enough for the entry level category. To prevent misunderstandings: Basic tasks, such as Office, Internet and video (UVD3-decoder) quad-core, are dealt with easily. AMD calls the combination of the HD 6620G, integrated in the processor, and the HD 6650M "Radeon HD 6740G2". While the former belongs to the low-end category because it lacks a video memory, the second graphics card is located in the midfield due to its 1024 MB DDR3 VRAM (900 MHz). The shader count and core rate also differ. Instead of 480 stream processors, the HD 6620G "only" has 400 shader units. The core rate is 444 rather than 600 MHz. Note: Because the Radeon HD 6620G uses the main memory, it should be clocked as high as possible and be set up in a dual channel mode (= two modules) at the same time. But why does AMD call the whole bundle HD 6740G2 anyway? There are a lot of notebooks with two graphics chips are available - and often include GPU switching. Now it gets interesting: As mentioned earlier, the HD 6620G and HD 6650M run as a CrossFire configuration. The graphics cards calculate the pictures alternately. Advantage: Providing that the GPU driver and the appropriate program cooperate, a significant performance improvement is achieved. Disadvantage: Visible micro stutters develop especially in regions below 30 fps due to the used AFR mode (alternate frame rendering). Thus, 25 fps seem to be jerkier than, for example, 20 fps on another system. Nvidia's SLI counterpart is faced with the same problem. Some games are rendered even slower on two graphics cards. 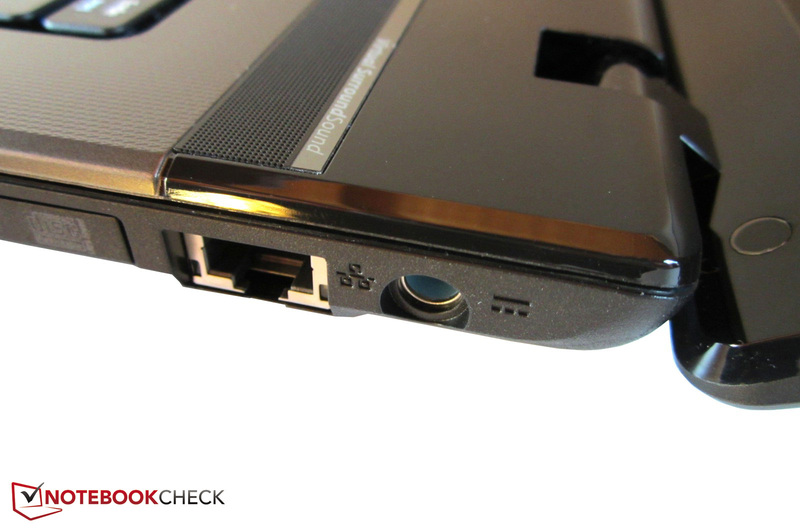 In any case, CrossFire was always enabled in our benchmarks (high performance profile). The Radeon HD 6740G2 develops its full potential in the newer DirectX 10 and DirectX 11 benchmarks. For example, the CrossFire configuration has a lead of almost 50% on the Radeon HD 6650M (Packard Bell EasyNote LS11-HR-050GE) with 1597 to 1013 points in 3DMark 11 (1280x720, performance preset, GPU score). A similar difference is revealed in the Unigine Heaven 2.1 benchmark (1280 x 1024, High, default tessellation) with 17.8 to 11.9 fps. Even the potent Radeon HD 6770M, a model of the upper midrange, can't keep up in either case (3DMark 11: ~1300 points, Unigine Heaven: ~17 fps). The tide turns in the DirectX 9 benchmarks: The dual GPU's performance is approximately on a par with the HD 6650M. The hard disk doesn't perform very well. Toshiba's 500 GB MK5059GSXP belongs to the slower 5400 rpm HDDs. 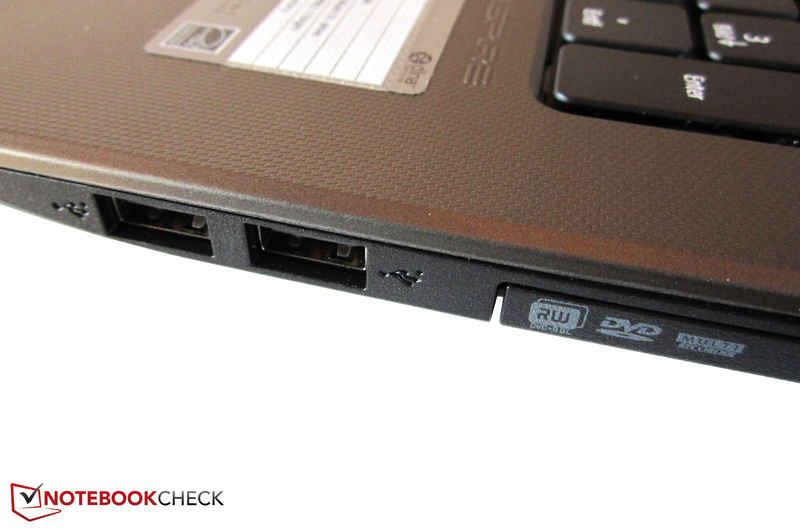 While fast 7200 models achieve an average transfer rate of over 80 MB/s in HD Tune (the HP Pavilion dv7-6b02eg, for example), the Toshiba HDD only manages 60 MB/s. The rates weren't overwhelming in CrystalDiskMark either. The sequential read and write rate was poor 70 MB/s. The system often made a slow impression and multitasking quickly proved to be too much for the notebook. 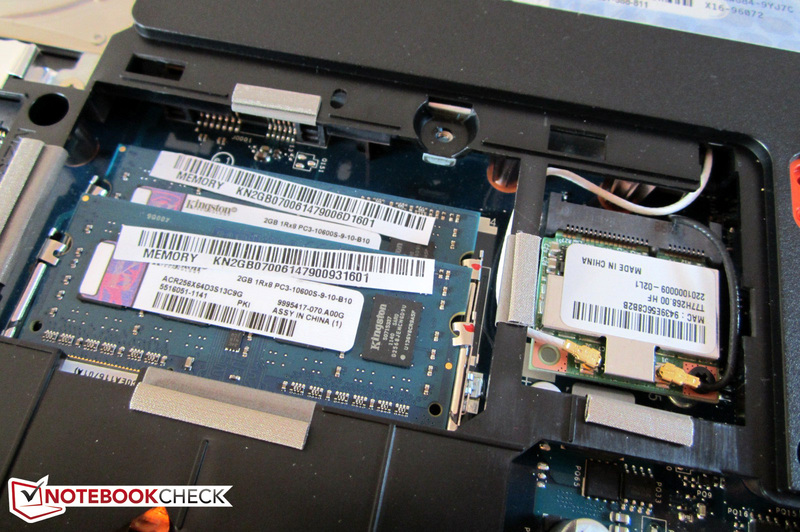 Although the device has a second hard disk slot, it's only possible to upgrade the memory capacity indirectly. A secondary HDD (resp. SSD) sticks out a bit and makes a different base plate necessary. The system performance unfortunately can't compete with an Intel notebook contender. 4231 points in PCMark Vantage is comparatively low. Equally expensive multimedia devices, such as the Packard Bell EasyNote TS13HR-197GE (Core i5-2450M & GeForce GT 630M) manage considerably higher results (6437 points). Less demanding users will however be content with the available power. To compare the performance of the Radeon HD 6740G2 better with other graphics cards, we performed the gaming benchmarks on an external monitor in a resolution of 1366 x 768. The GPU driver wasn't updated; the results originate from the preinstalled 8.901.3.0. 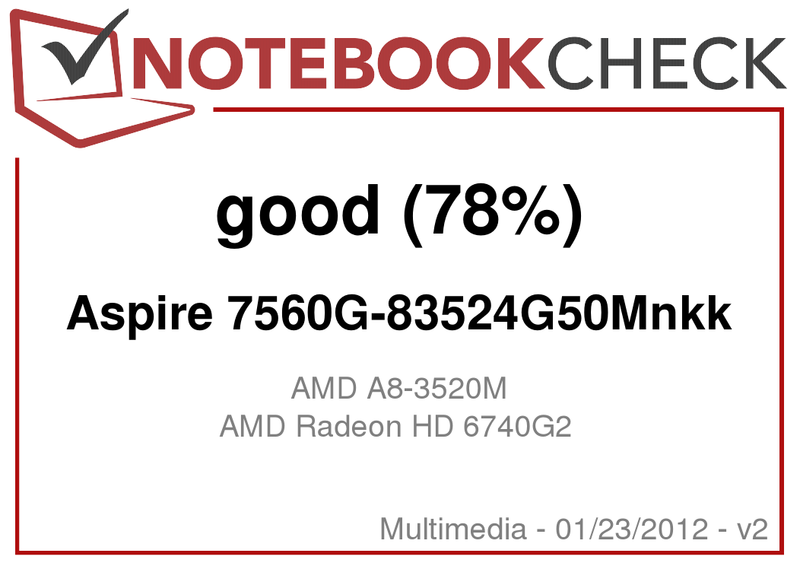 More benchmarks can be found in the review of the smaller brother, Aspire 5560G. The current building strategy reference puts a high demand on the Radeon HD 6740G2. We could observe extreme stutters when using high details and 1366x768 pixels in the intro of the first single player mission. The dual GPU team places itself clearly in front of other midrange graphics card, such as the GeForce GT 630M (17.5 fps @ Acer TravelMate 5760G-2454G50Mnsk) with an average of 26.6 fps. 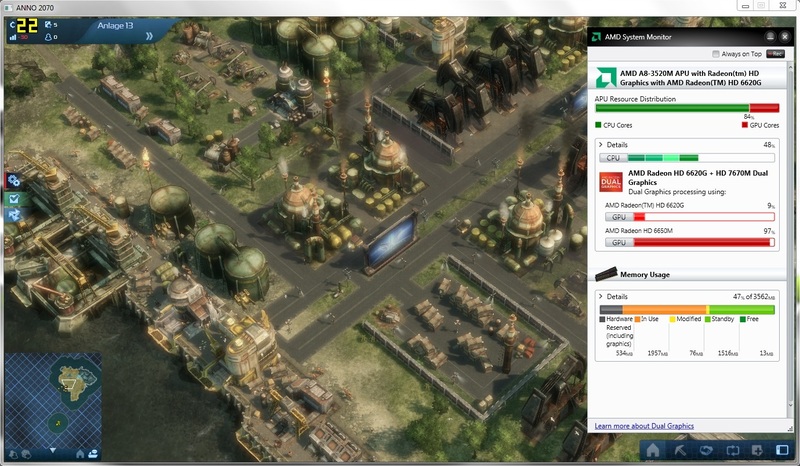 The otherwise often stronger Radeon HD 6770M achieves a comparable refresh rate in Anno 2070 (27 fps @ Apple MacBook Pro 15). Medium details are a good compromise of performance and graphics quality for the Radeon HD 6740G2. 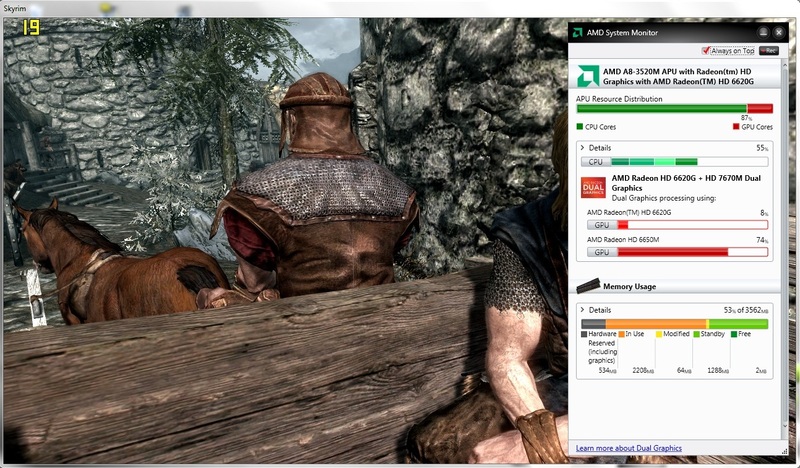 High details and 1366x768 pixels overburden the 17 inch device in Skyrim. 19.9 fps, which we determined in the carriage ride, stand for an extremely jerky image buildup. Nvidia's popular midrange model, the GeForce GT 540M (Asus U46SV-WX036V), is on a par with the Radeon HD 6740G2 with 21 fps. 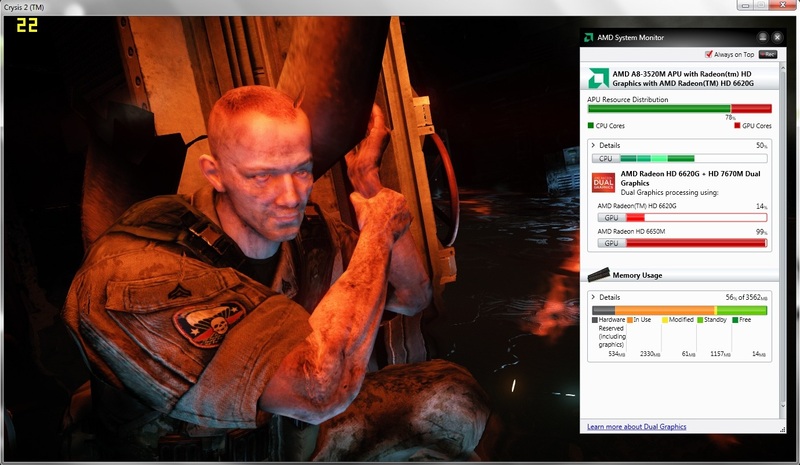 AMD's Radeon HD 6770M only has a weary smile for such results (30.4 fps @ HP Pavilion dv7-6b02eg). We would recommend medium settings, as in Anno 2070. 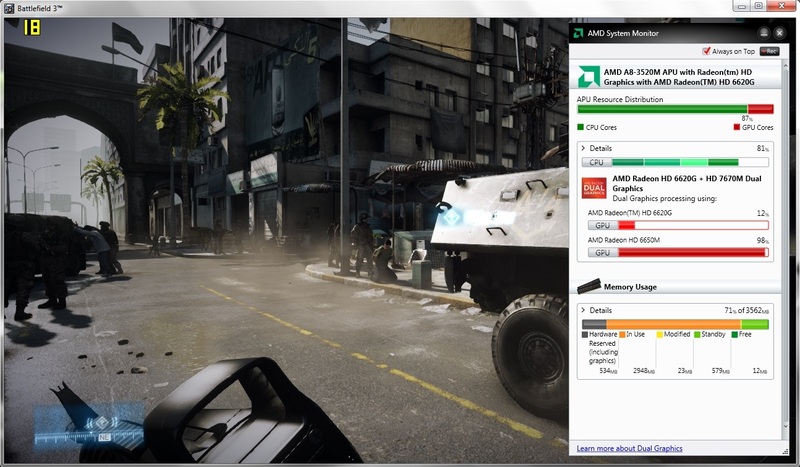 The steep hardware requirements of Battlefield 3 are especially noticed in entry level and midrange notebooks. Our demanding benchmark sequence (start of the single player mission "Operation Swordbreaker") doesn't even run absolutely smooth on good notebook graphics cards, like the GeForce GT 555M (24.5 fps @ Asus N75SF), in 1366x768 pixels and the preset high. The same applies to the Radeon HD 6740G2, which only achieved 24.4 fps in the test. Since normal midrange GPUs stay below 20 fps, the Aspire 7560G earns kudos in any case. Medium settings should be used in real life because of micro stutters. The Radeon HD 6740 HD 6740G2 easily copes with the latest Fifa offshoot. 1366x768 pixels, high details and two time antialiasing lead to an absolutely smooth 69.5 fps in the demo. While the Radeon HD 6770M beats this result by nearly 35% (93.7 fps @ HP Pavilion dv7-6b02eg), the GeForce GT 555M spurts past it by more than 100% (158.4 fps @ Asus N75SF-V2G-TZ117V). 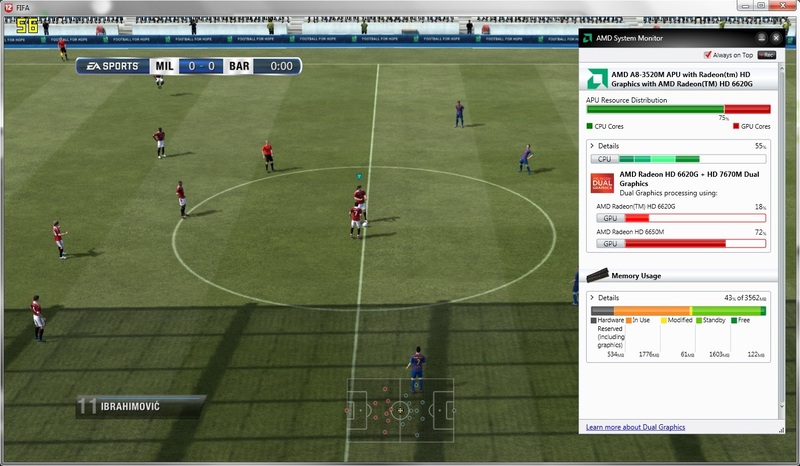 It's no surprise since the soccer simulation loves Nvidia graphics cards. 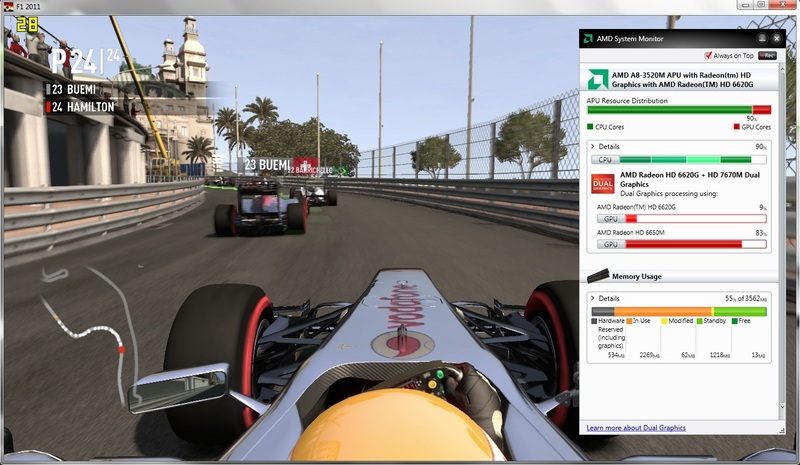 F1 2011's built-in benchmark is perfect for performance comparisons. Too bad: The multimedia notebook doesn't render the combination of 1366x768 pixels, high details (DX 11) and two time antialiasing. The CrossFire configuration places itself behind most midrange graphics card with 26 fps. Even Nvidia's entry level version, GeForce GT 520M, doesn't process much slower in F1 2011 (24 fps @ Dell XPS 14z). The Radeon HD 6740G2 looks like an old hat compared to the GeForce GT 555M (53 fps @ Asus N75SF-V2G-TZ117V). Perhaps window mode was responsible for the poor performance. Image errors unfortunately turned up in full screen mode on the test device. Users will have to be content with the medium detail level (DX 9) until a new driver remedies this. The Radeon HD 6740G2 fortunately wasn't unexpectedly slow in Crysis 2. The Aspire 7560G nevertheless struggled with 1366x768 points and the preset very high (DX 9) in the submarine ride at the beginning of the single player mission - 25.8 fps are too little for a first person shooter. These settings require at least a graphics card of the upper midrange. An example? The HP Pavilion dv7-6101eg equipped with a Radeon HD 6770M finishes the benchmark sequence with 40.8 fps. 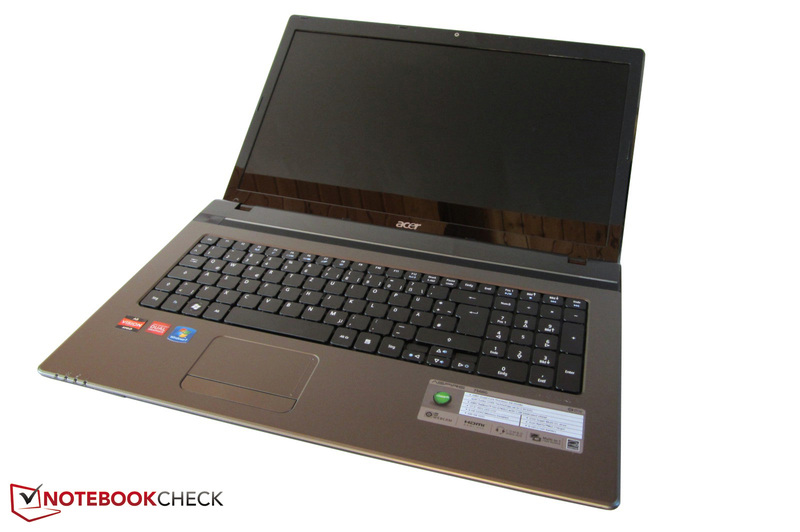 The Radeon HD 6740G2's frame rate sooner ranges in the field of lower-performance models like the GeForce GT 630M (27.1 fps @ Acer Aspire 5755G-2678G1TMtks). In return, the notebook copes well with high details and a moderate resolution. The Radeon HD 6740G2 is actually too weak for 1600x900 pixels. 1366x768 pixels (not supported by the screen) already stutter in high details in the latest hits. Moreover, the performance fluctuates extremely depending on the track. While the refresh rate sometimes matches up to the Radeon HD 6770M or GeForce GT 555M, the dual core team still has to admit defeat to midrange models like the GeForce GT 630M. The performance is about on a par with the Radeon HD 6650M in most cases. There should be some headroom available when AMD makes improvements. 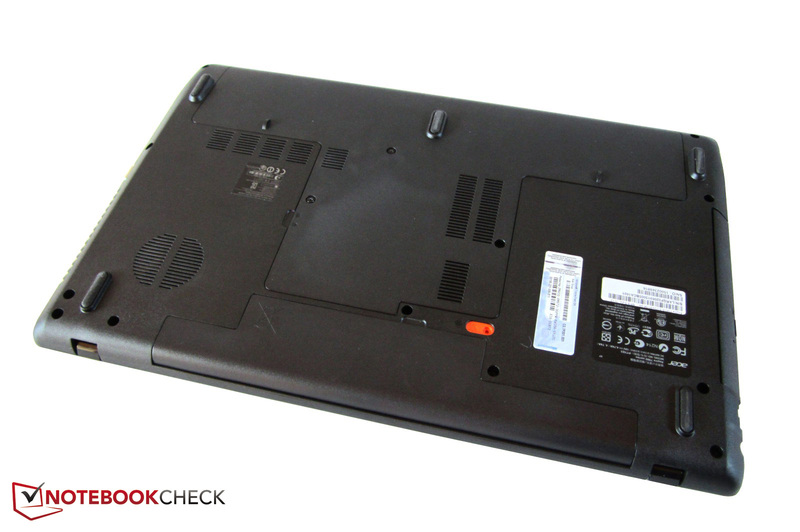 It's not exactly easy to complain about the performance in view of the laptop's low price. User's who don't want to perpetually take care of the GPU driver and its settings should nevertheless opt for another device. 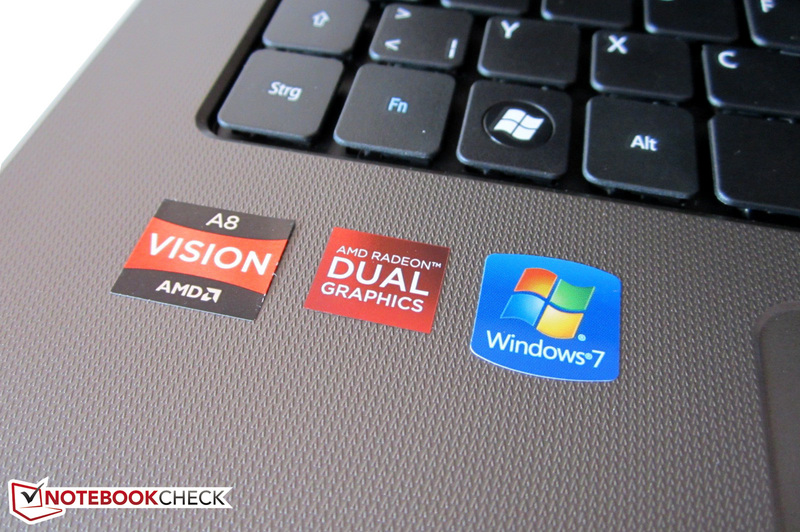 Conventional notebooks with only one active graphics card aren't as strenuous and offer a more stable performance. There are a few alternatives available that also have a gaming-capable midrange GPU for €600 (for example, the Packard Bell EasyNote TS13HR-197GE). Avid gamers will first be satisfied with a high-end graphics card on a par with the GeForce GTX 560M. Thanks to the component's low waste heat, the cooling system doesn't have much to do. The hard disk is mainly heard in idle. It rotates on a constant, but in no way unpleasant, manner. The noise level stays agreeably low in basic tasks, like office or Internet, because the fan is rarely active. Great: The fan speed only increases slightly to an absolutely acceptable level during higher load. Even more quiet games aren't drowned out - and that isn't a matter of course for gaming capable notebooks. The optical drive is still the most audible noise-maker. It accompanies DVD playback with a tolerable whir, though. 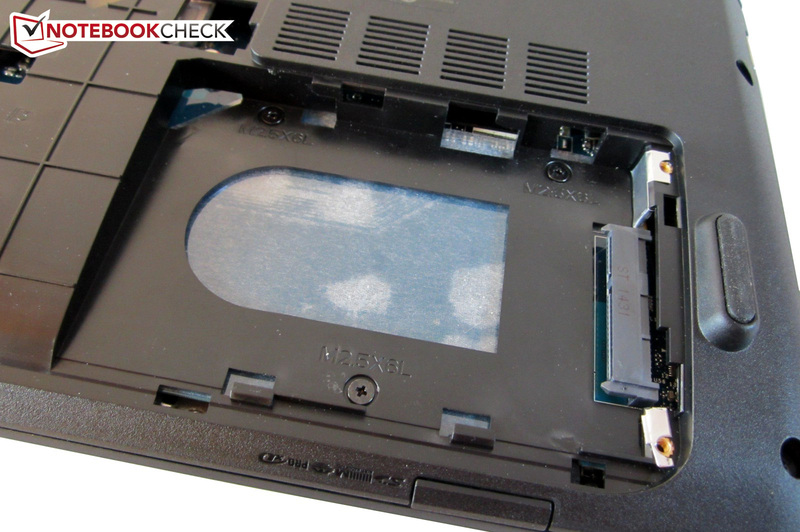 Nevertheless, the fact that the DVD burner occasionally speeds up may annoy a few users. 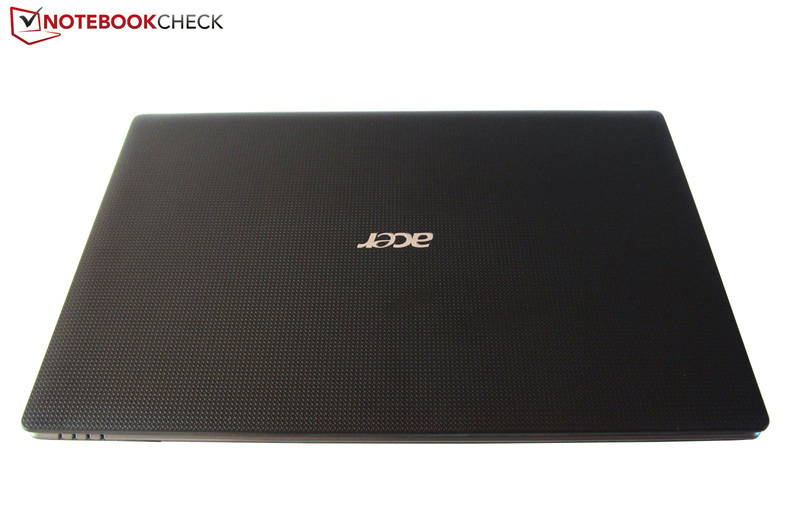 However, the Aspire 7560G is overall surprisingly quiet. Sensitive natures may take this device without hesitation. One of the AMD components biggest strengths is the moderate temperature development. 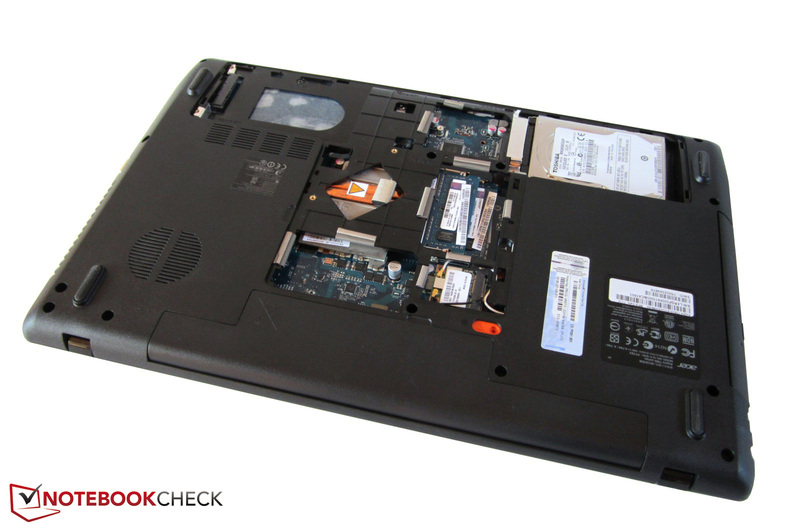 While the CPU and GPU of Intel based laptops tend to reach 80° or even 90°C (compare e. g. the Acer Aspire 5755G-2678G1TMtks), the components in the Aspire 7560G always stay below 65°C - kudos. Accordingly, no throttling was observed in the stress test (full load through Prime and Unigine Heaven benchmark). 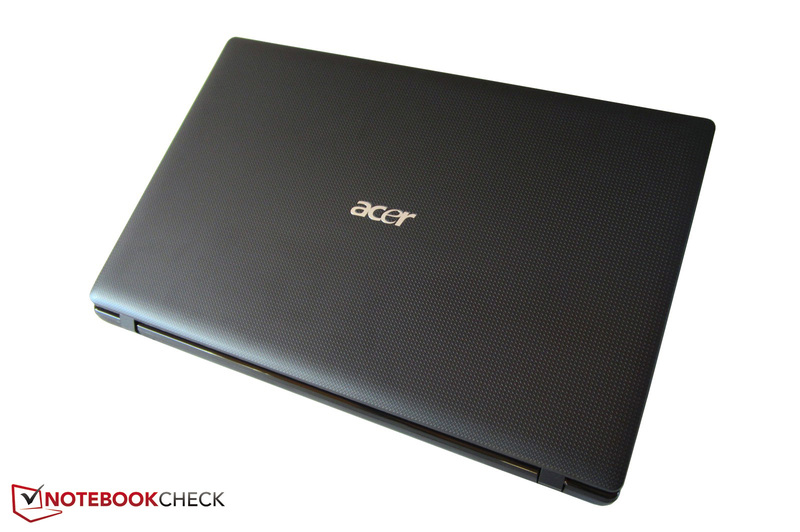 The A8-3520M always clocked with at least 1.6 GHz. The case's surface temperatures are also acceptable. The base unit only heated up to 27°C in idle. The hands are only warmed a bit during load. We measured an average of 32°C in the stress test. Thus, working with the 17 inch laptop for several hours isn't a problem. We would say that the sound quality is good. 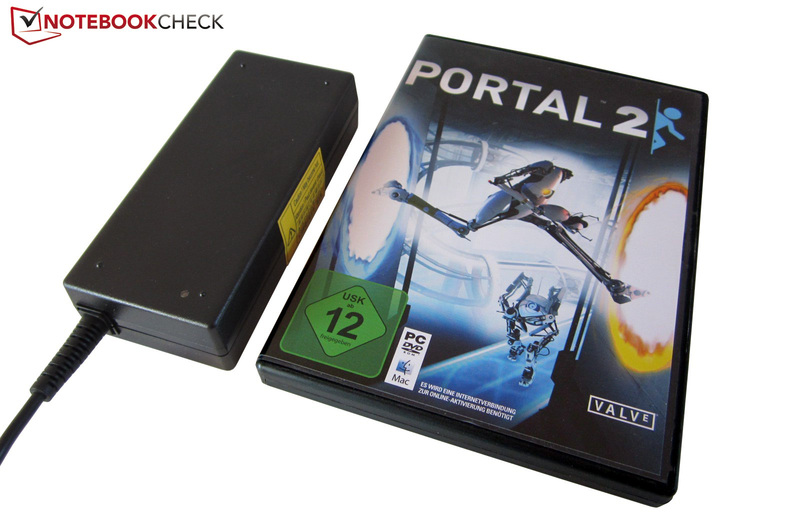 Although both speakers, located above the keyboard, lack bass, the maximum volume can at least convince due to the Dolby technology (has three preconfigured scenarios: movie, music & game). Nevertheless, headphones or an external sound system should be used because the sound is a bit tinny and imprecise when listening closer. However, the speakers can be used on the move. 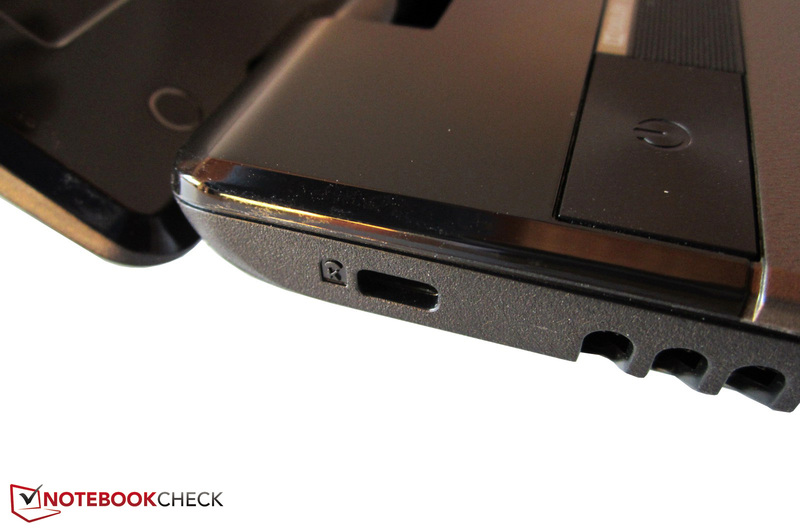 The Asus N75SF and the Dell XPS 17 can serve with a significantly better sound quality. 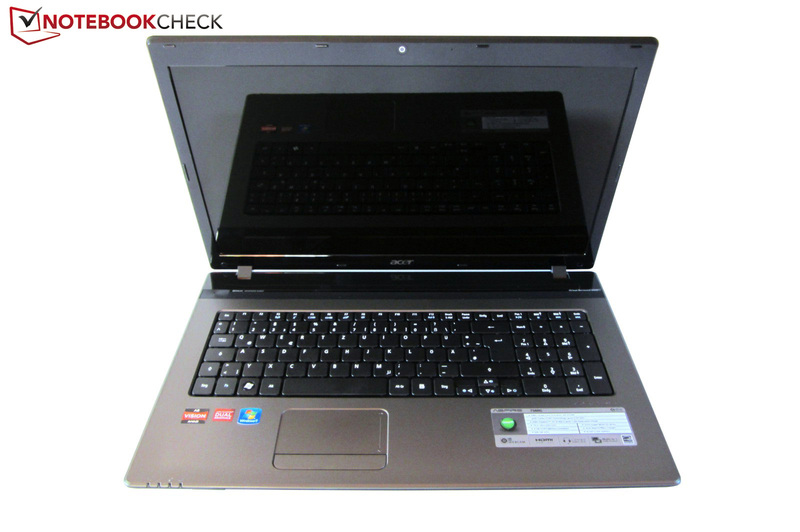 Acer has designed the multimedia notebook to be energy-efficient. About 10-15 watts in idle mode and 40-50 watts in load is outstanding. 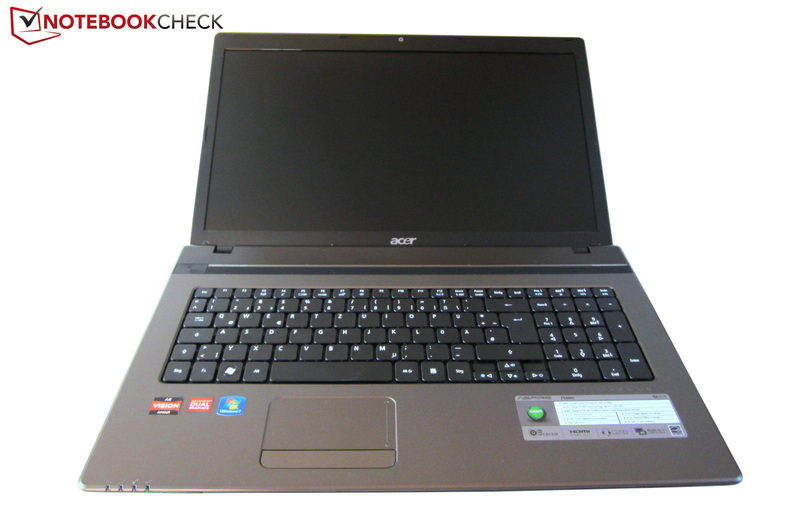 Therewith, the 17 inch laptop doesn't consume more power than smaller office devices equipped with ULV processors, such as the Acer TravelMate 8481TG (Core i5-2467M & GeForce GT 630M). The low power consumption indicates a good energy management on AMD's part. Is that the perfect preconditions for a long battery life? 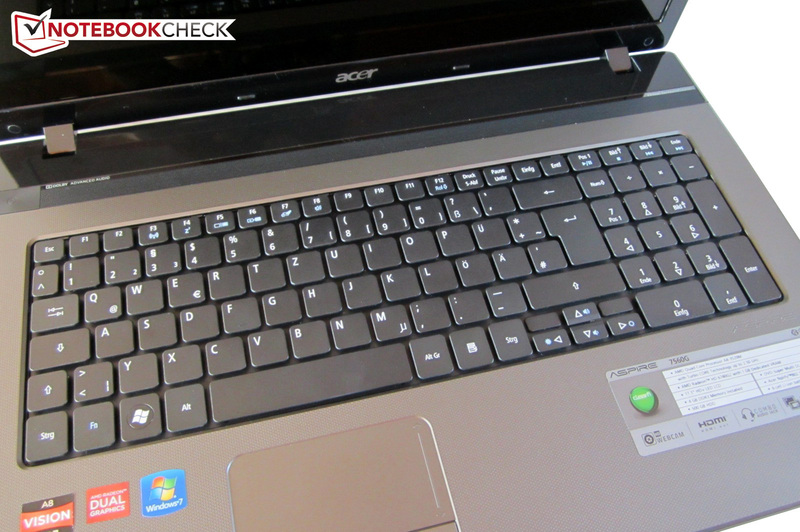 Theoretically, yes - if Acer hadn't supplied the notebook with a weak 6 cell battery (48 Wh, 4400 mAh). The 17 inch laptop at least lasts for a fairly long time without the power adapter in idle and minimum brightness, as well as deactivated CrossFire. 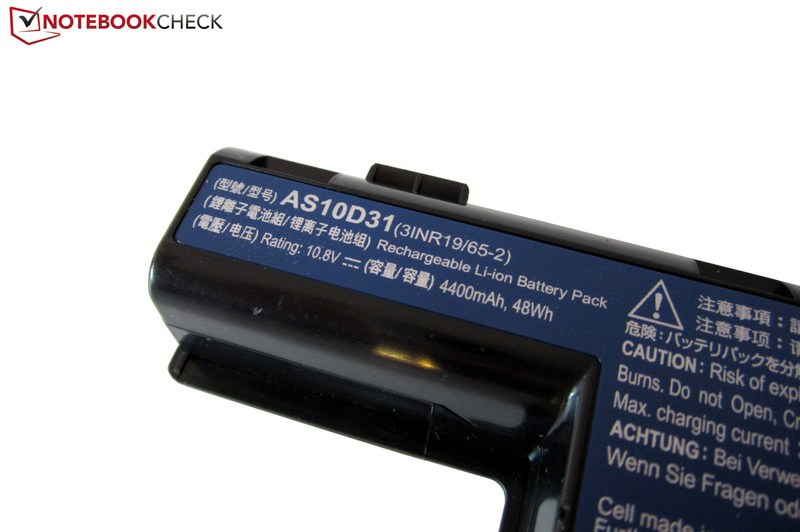 We almost managed 6.5 hours in the Battery Eater Reader's test. Computing intensive tasks and the maximum brightness (CrossFire enabled) cut the battery life in half - three hours of movie time won't knock anyone's socks off. The multimedia machine is drained after one hour in the worst case (high load). Acer has launched an interesting multimedia laptop with its Aspire 7560G. Rather than throwing the umpteenth Intel/Nvidia combo onto the market, the manufacturer takes a go at the AMD platform. The performance verdict is contradictory though. The quad core Fusion processor, A8-3520M, is surpassed by Intel's low-end Core i3-2310M in terms of pure performance. However, the integrated HD 6620G graphics chip teaches its Intel counterpart, HD Graphics 3000, the meaning of fear. The combination with the dedicated midrange GPU, Radeon HD 6650M (= HD 6740G2), results in a quite remarkable 3D performance - especially in view of the notebook price. More gaming power is hardly possible for a €600 device. However, both graphics card can first really develop their full potential when the user takes care of the notebook appropriately and keeps the GPU driver up to date. Unfortunately, the CrossFire mode didn't work perfectly in the test. On the other hand, the low temperature and noise development have to be highlighted positively. Neither the components nor the case surfaces get too warm during load. Moreover, the multimedia machine works agreeably quiet even in gaming use. Beyond that, the low power consumption ensures good battery runtimes. But then, why doesn't it achieve a higher rating? Well, there are a few points of complaint: First the interface diversity proves to be rather poor. Apart from omitted ports (eSATA, FireWire & ExpressCard), the absence of a USB 3.0 is particularly displeasing. A slow HDD, a second-rate keyboard and an inferior glare screen add to that. The high black value, the poor viewing angles and the low contrast quickly awake the desire for an external monitor. Price-conscious, casual gamers who want as much gaming performance possible for €600 might take a liking to the Aspire 7560G. Lid and wrist rest score with a nice pattern. It's not possible to install a second HDD with the standard base plate. The 6 cell battery is unusually wide. Its capacity is only in the midfield, though. The wobbly keys tilt sideways. 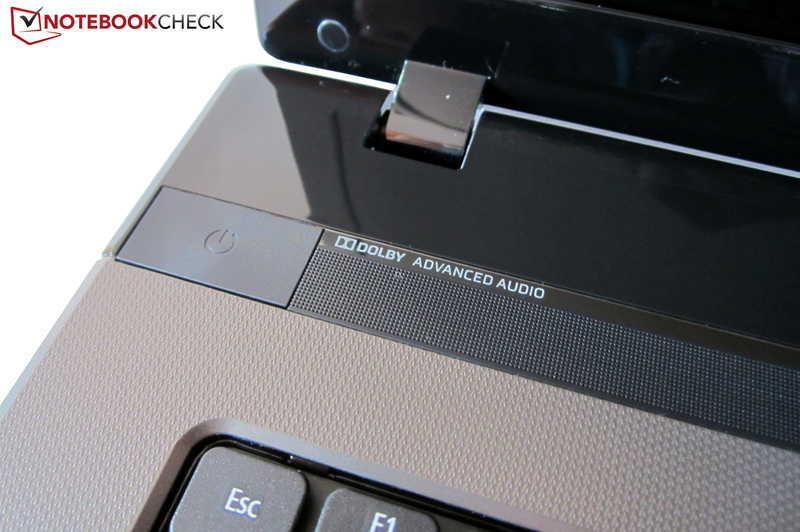 Dolby Advanced Audio enhances sound rendering. 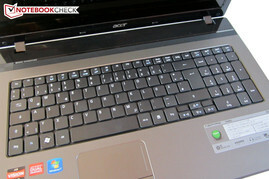 Typical Acer: The arrow keys are much too small. AMD processors are primarily found in the entry level sector. The hardware should definitely suffice for undemanding users. 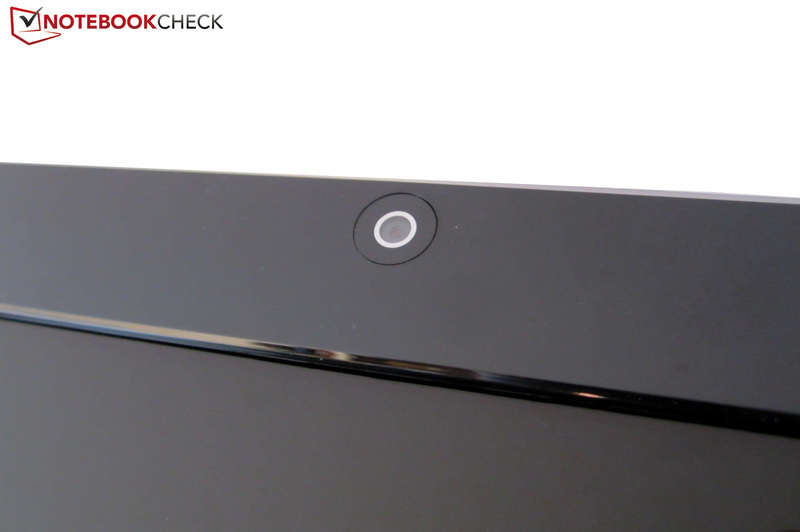 The lowered touchpad supports several gestures. A 5in1 card reader is on the front. The buyer doesn't get USB 3.0. Acer limits itself to the most important interfaces. The port distribution only convinces to a part. Using external monitors is possible thanks to VGA and HDMI. The compact 90 watt power adapter weighs about 360 grams. Both memory slots are occupied. Acer builds in a pretty slow HDD. The gray keyboard bezel sets a nice touch of color. The surfaces are quite resistant due to the matt finish. Five rubber feet ensure a good grip. Both hands should be used for opening. The notebook isn't quite four centimeters high. The maximum opening angle is approx. 150°. The multimedia machine looks plain from the outside. There is no keyboard light. 2.9 kilograms are acceptable for a 17 inch device. As usual, a cover can be removed from the bottom. The glossy screen reflects intensely in daylight. The Aspire 7560G belongs to the lower-priced multimedia laptops with €600. The optical drive is on the right. The maintenance cover is kept in place by three screws. The fan isn't easy to clean. The notebook is delivered in a white and blue box. A fast HDD and a good screen. 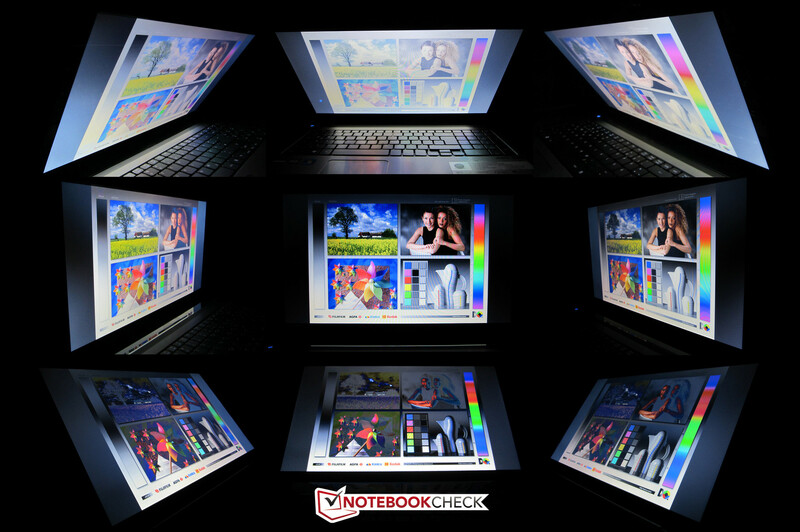 The notebook is energy-efficient, cool AND fairly quiet. All-rounders with a good graphics card for less than €1000, such as the Acer TravelMate 5760G (15"), the HP Pavilion dv6 (15") or Pavilion dv7 (17"), the Lenovo G770 (17"), the Packard Bell EasyNote TS13HR (15") or the Samsung RC530 (15") or RC730 (17").